‘The Niceties’: Should history be written in pencil? BOSTON – It starts with a comma. A missing comma. But it quickly escalates into something that tears apart a campus. The Huntington Theatre Company production of “The Niceties” at the Calderwood Pavilion of the Boston Center for the Arts begins with what appears to be harmless sparring between a professor and her student about a thesis and escalates into bloodsport, and a pitched battle over just what constitutes American history and whose version of it is correct. Janine is proud of the life she has forged in academia. Jordan Boatman is Zoe, an African-American junior at the college, who at first seems eager to please a professor who can help her get to the GPA she needs to qualify for a prestigious fellowship. She brings the draft of her history thesis to Janine, who notes the missing comma, and things spiral downward from there. Janine proposes Zoe put in extra work with her on the paper, but it seems out of the question because of conflicts with Zoe’s upcoming social justice events. The discussion turns to slavery and the Founding Fathers. Janine notes the practice, though reprehensible, was actually legal at the time and not declared illegal as the states banded together to form the United States of America. Much to Janine’s horror – she has a framed portrait of Washington on the wall – Zoe more or less trashes the Founding Fathers as unreconstructed racists. Zoe theorizes that a society and an economy built largely on the backs of slave labor is inherently racist from its very underpinnings. Janine is critical of Zoe’s thesis, what she sees as faulty sources and the way research in general is done by those of Zoe’s generation. At the end of Act 1, the discovery of a deed done undercover and without permission dramatically ups the ante. Playwright Eleanor Burgess, a Brookline native and Huntington playwriting fellow, was inspired to write “The Niceties” by an actual incident at Yale in 2015 where an email sent by one half of a celebrated husband and wife teaching team that had to do with Halloween costumes turned into a raging bonfire that included protests and threats. She has crafted“The Niceties” into a taut, well-constructed piece. One piece of the Yale controversy that Burgess has also explored has to do whether an educator has an obligation to comfort and support the student, no matter what, and whether the mere questioning of a student’s feelings or attitudes can be racist just by itself. The second act takes place three weeks after Act I, and the effects of the decisions both the professor and student have made have taken a huge toll on both of them. There will also be a few more plot twists that will flesh out the background of the characters and add further fuel to the fire. The stakes will keep escalating until not only jobs and reputations are on the line, but health and safety, too. There will be negotiations but seemingly no way to find middle ground, if ever it existed between the two. Kimberly Senior’s direction, two excellent performances, and Burgess’ take-no-prisoners style had audience members squirming uncomfortably or looking for a moment when they could breathe easily. Burgress said in an interview that she was is hoping that after “The Niceties” conversations will continue, and undoubtedly they began moments after exiting the Calderwood Pavilion of the Boston Center for the Arts. Perhaps one of the biggest takeaways is that going forward, history books should be written in pencil. 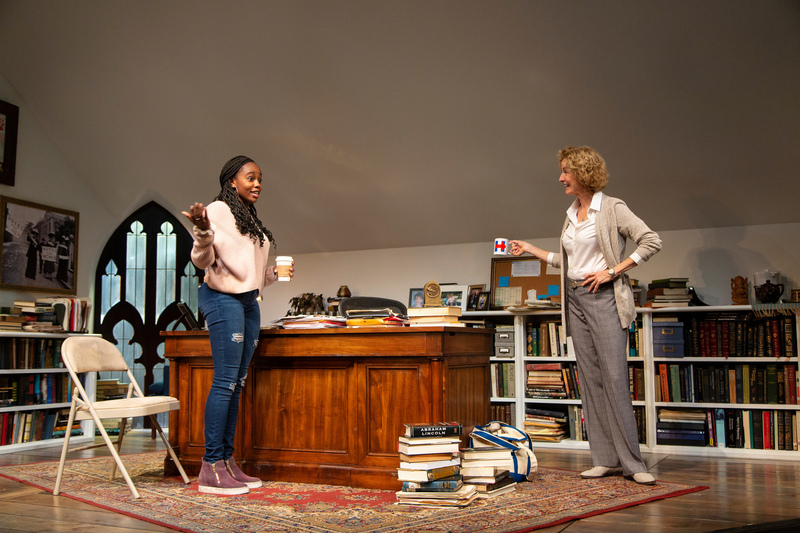 The Huntington Theatre Company production of “The Niceties.” Written by Eleanor Burgess. Directed by Kimberly Senior. Scenic design by Cameron Anderson. Costume design by Kara Harmon. Lighting design by D.M. Wood. Original Music and sound design by Elisheba Ittoop. At the Calderwood Pavilion of the Boston Center for the Arts through Oct. 6.. huntingtontheatre.org.